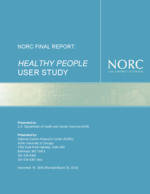 NORC Final Report: Healthy People User Study NORC Final Report: Healthy People User Study National Plan to Address Alzheimer's Disease Assessing the Status and Prospects of State and Local Health Department Information Technology Infrastructure The HHS Hubert H. Humphrey Building Cafeteria Experience: Incorporation of the Dietary Guidelines for Americans, 2010 into Federal Food Service Guidelines. Healthy People 2010 had a high level of visibility with the responding health organizations/agencies. Overall, 91 percent of the responding organizations/agencies were aware of the initiative. This percentage shows a statistically significantn increase from the 83 percent that were aware of the initiative in the 2005 User Assessment. All of the responding HP Coordinators and Chronic Disease Directors, 92 percent of the local health organizations, 78 percent of the MTAHB, and 71 percent of the tribal health organizations reported awareness of the initiative. These levels of awareness show a statistically significant increase since 2005 for local health organizations. Furthermore, while awareness is growing among local and tribal health organizations, While tribesthese organizations continue to be significantly less likely to be aware of the initiative compared to both local and to state health organizations, awareness among tribal health organizations has greatly increased since 2005 (see Exhibit 7). Exhibit 7 is a bar chart showing the percent of responding HP Coordinators, Chronic Disease Directors, MTAHB, Tribal Health Orgnaizations, and Local Health Organizations that are aware of Healthy People 2010, and the percent that were aware of Healthy People 2010 from the 2005 Assessment.